USFSP Associate Professor of Political Science Judithanne Scourfield McLauchlan received the 2018 Graham-Frey Civic Educator Award. Judithanne Scourfield McLauchlan, USF St. Petersburg Associate Professor of Political Science, has been named the recipient of the 2018 Graham – Frey Civic Educator Award. 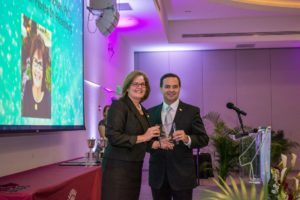 The award, from Florida Campus Compact, was presented to Scourfield McLauchlan at an Oct. 25 ceremony at the University of Miami in Coral Gables. The Graham-Frey Civic Educator Award honors the extraordinary civic legacy of Florida Governor and United States Senator Bob Graham and United States Congressman Lou Frey, who were both major proponents of civics education in the sunshine state. Scourfield McLauchlan said she was honored to receive the award, which recognizes an outstanding faculty or staff member for contributions to the development of civic learning and engagement in sustaining participatory democracy. In addition to teaching courses in American Government and Public Law, Scourfield McLauchlan is the founding Director of the Center for Civic Engagement at USF St. Petersburg. McLauchlan also has extensive experience in American government and politics. She is currently coordinating a new program with the Florida YMCA to create a Civics Fellows program, which launched this month. The new program provides scholarships for 75 Florida high school students, where they can earn up to six college credits in politics and leadership at USFSP while gaining hands-on experience in government and public service. Florida Campus Compact galvanizes the intellectual resources of more than 50 institutions of higher education in Florida by advancing high-impact practices that enhance student learning and benefit local communities. Florida Campus Compact works with presidents and their campuses to integrate service with academic study and to provide a collegial experience for intercampus and community collaborations. Colleges and universities are engaged with their local communities, working together to educate citizens, solve problems and build a strong economy. 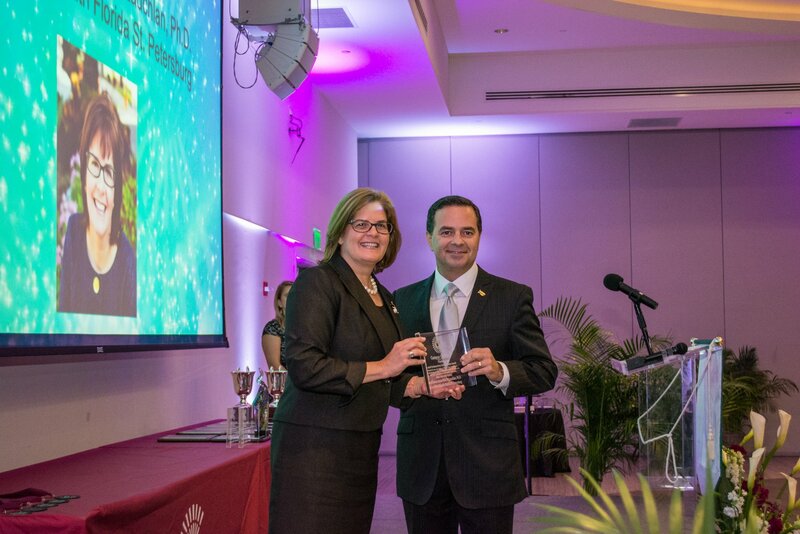 To see a full list of winners from Florida Campus Compact’s Annual Awards Gala, visit the organization’s website.